I have not seen a lull in the subway art craze and it has finally caught up with me...lol! I used it as in inspiration to create this card that I may actually frame for our game room (which is right now doubling as a storage facility). A tribute to kicking off the college football season! Pretty soon it will be fall leaves, apple cider and cinnamon candles to follow :) I love fall...it is my favorite season. Sad to say goodbye to summer, but I just love all of the inspiration....AND FASHION...that fall brings :) Bring it on!!! What season inspires you the most? This would be great framed up for the season. Hey Sweetie, Thanks for the kind comment....I feel out of the loop and with the Puppy and Scout, have barely had much time to create. I'm happily working with a new Rescue and will likely become a Foster for them soon, which is such a joy!! As for my Silhouette...I LOVE it and have taken many of Kerri's Classes. Right now, I am taking the newest, which just started this week (Design Secrets) and it's more of an intermediate class, but awsome. I took her beginner classes and I also took the color class, plus I have the Designer Edition which is an upgrade but Worth every penny....if you watch for sale you can often get it for a great price...that's what I did!!! I think you would learn so much..she's an amazing designer and used to once work for them. She's now on HSN with Lisa Bearnson and they developed part of one of the Life Kits...I dont' do those, but I'm sure they did a great job!! I miss you all a lot and do see post from time to time on FB..otherwise, I'm out of touch, but once Skye grows up a bit more, I'll have more free time again and for now, I just LOVE spending my time iwth the pups...enjoying what is left of Summer...my favorite season!! I really like using the label maker for the sentiment, cute card! My SIL would love this. I was going to send him a big iced shamrock cookie to start the season, but he just started a new diet. Great card, Pryn. i LOVE this! 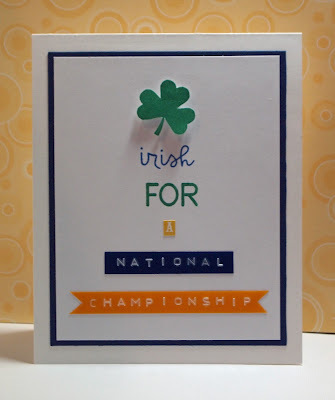 i'm hoping the irish is for the fighting irish..?? 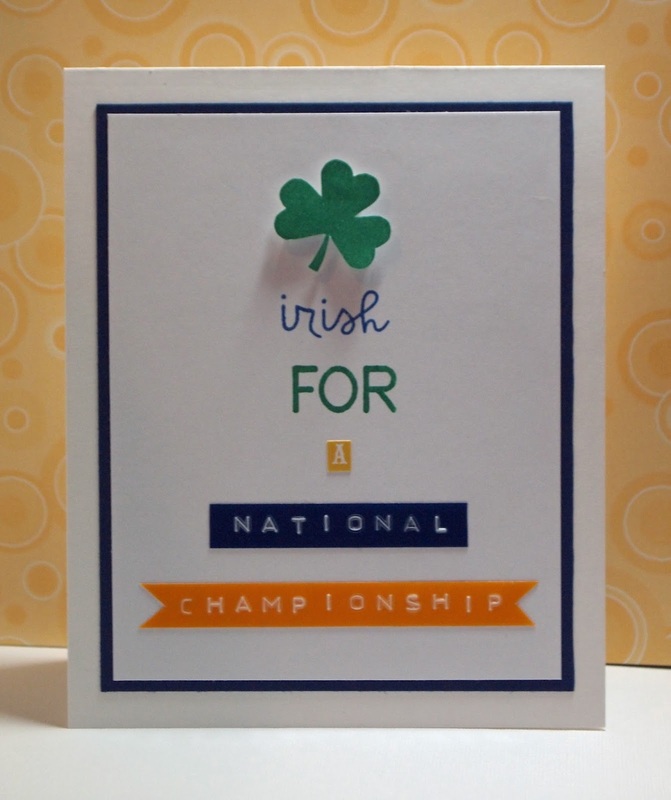 I was born in a Notre Dame parking lot so I will always root for the irish! lol! I love how crisp and clean this is. Wonderful! I love your card. Don't you think even using that squeeze label maker is fun? Love the simplicity and banner use! hey friend Pryn. Nice card. Hope you are fine. Great use of banners. And I love that you used soooo many different products that match perfectly! I miss you and wanted you to know it:) Hugz sweetie!